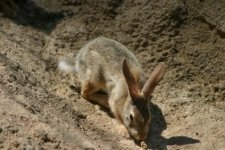 Rabbits in Australia are a serious pest but we've included them in our Australian animals because we saw so many of them growing up in the bush. The spread of feral Rabbits from the initial release of only 24 in 1859 was rapid and destructive. They are an invasive species whose introduction to Australia has caused devastation of habitats and is responsible for the major decline and extinction of many native Australian animals. Growing up in the outback when our Father was a boundary rider on the Dingo Fence that seperates New South Wales, Queensland and South Australia we saw them all the time. In fact we used to set traps and go shooting as well, our Father used to get paid for every pair he got. Because our Father didn't earn a lot of money from being a boundary rider and he had to support our rather large family of six kids, he needed to supplement his income and he did so by selling the pairs. We'd go out in our 4wd at night and Dad, along with one of our brothers at times, would shoot them, then our Mother and the older kids would skin them, gut them, pair them and hang them in the back of the 4wd. The introduction of Rabbits in Australia by Thomas Austin was a serious mistake and he totally miscalculated the effects it would have on not only the native Australian animals but also on our plant life which to this day is still not fully known. Austin believed the introduction of a few of them could do little harm and would bring a touch of his home to Australia. But Australia had the perfect conditions for a population explosion. Because of our mild winters, they were able to breed for the whole year. In 1901 the Western Australian Government started building the first Rabbit Proof Fence, it was finished in 1907 and at about 1,830 kilometres it was the longest Rabbit fence built. In 1902, before the first fence was even finished, they had made their way past it, west of the fence. Two more fences were built, the 2nd fence further west was started in 1905. 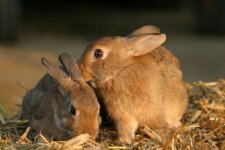 In 1950 the Australian Rabbit population had increased so much that Myxomatosis (a severe viral disease) was deliberately introduced into Australia and released into the population which caused a drop of around 500 million, this still left the population at about 100 million. By 1991 the population had recovered to about 200-300 million due to genetic resistance. In 1996 CSIRO scientists released calicivirus which turned out to be too successful because it killed too many, leaving some predators starving. But no doubt they will find a way around this too. When they're pet bunnies they are cute but when the population explodes as rapidly as it did in Australia and has the devastating consequences that they have had here they need to at least be controlled.